Looking south towards the west tower (left) and Lower Manhattan. 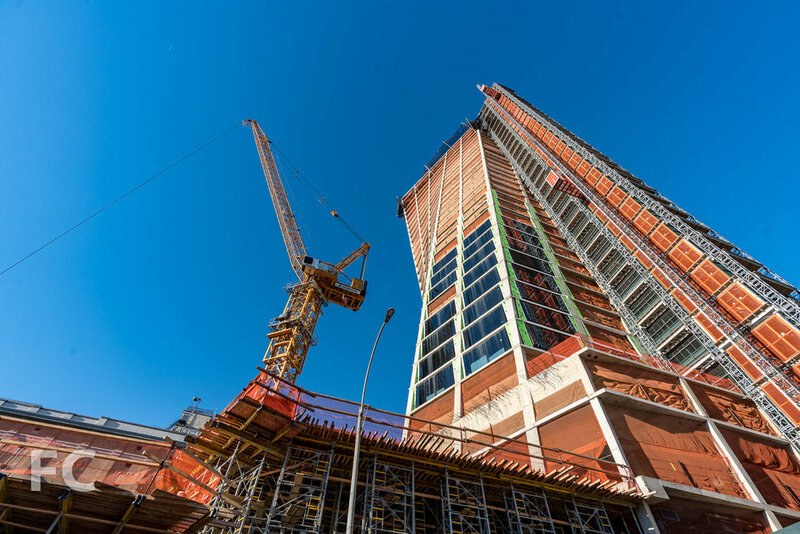 Superstructure has topped out and facade installation continues at the west tower of HFZ Capital Group's The Eleventh, a mixed use development at 76 11th Avenue. Designed by the Bjarke Ingels Group (BIG), the development consists of two twisting towers atop an 85 foot podium adjacent to the High Line. The 36-story west tower rises 400 feet and will consist of residential units and supporting amenities. A 26-story east tower, recently started, will rise 300 feet and consist of a mixture of residential units on the upper floors and a Six Senses hotel on the lower floors. West facade of the west tower. East facade of the west tower. Northeast corner of the west tower from the High Line. 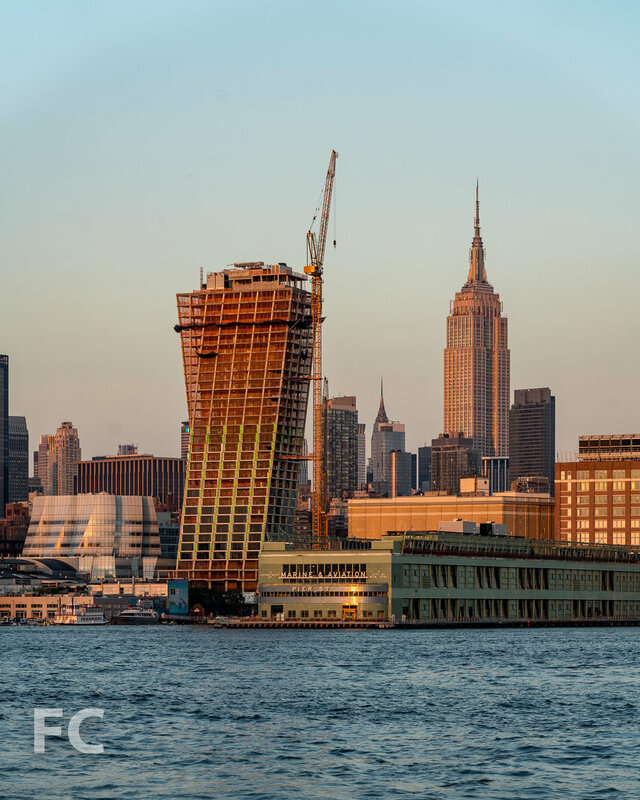 Cladding for the towers include unitized window wall system with a bronze trim and travertine composite panels, which will eventually clad the structural piers and slabs surrounding the windows. Closeup of the northeast corner of the west tower. Southeast corner of the west tower (background) and the start of the east tower (foreground). Looking up at the northeast corner of the west tower. Southwest corner of the rooftop of the west tower. View south towards Chelsea and Lower Manhattan from the rooftop of the west tower. Rooftop view of One World Trade Center rising above Lower Manhattan. View north towards Hudson Yards and Midtown from the west tower. View of Chelsea’s iconic architecture from a northwest corner unit. View of the Hudson River waterfront from a southwest corner unit. View of Hudson Yards from a north facing unit. Looking down on the site of the east tower, starting its rise. East tower and sitework underneath the High Line.